I’m sitting here at the La Quinta Inn & Suites, near Disneyland. It’s Saturday morning and the breakfast hall is filled with anxious children, worn down parents, and crying babies. The breakfast, pretty typical for a motel, isn’t too bad. The coffee is hot which is good because it’s terrible. Good coffee, the really good stuff—freshly roasted, brewed heavy, bowel shakingly strong—doesn’t matter what temperature it cools down to. It has flavor, you see. Today marks a week of travel for my wife and I. Our goal was to find a place to live in Rochester, NY, so we flew over there and stayed a few days. I met with the University as well, discussing what I need to get in order. We stayed with old friends, met with new people, found some internet people (Tony, I’m glad you’re a real person. You just never know!). We drove to, what felt like, every corner of Rochester searching for apartments. It’s been a rough week of travel. We had rental car issues and hotel issues; our Chicago layover turned into a mid-life crisis (a storm came in—on our way back to LAX—and the lightning grounded all flights). So we sat in the terminal. Every few minutes we’d find out our flight was delayed further. Many flights were cancelled, so we were thankful, at least, ours wasn’t. As the night progressed, lines built up, people paced, airport employees updated through indecipherable intercoms. I was mixed. Yes, I desperately wanted to leave, but no, I didn’t want to die in a Chicago storm. The storm would pass and I was fine waiting. After all, we packed Redbox DVDs and found a seat near a charging plug. As the night turned later, people’s attitudes grew dimmer. I wont lie and say that I didn’t complain, because I did. Ultimately though, I was starkly reminded that worrying and complaining—literally—get’s you nowhere. We were stuck in an airport and had nothing to do but practice patience. With the Lord’s favor, we made it back to LA in time to pick up Megan’s sister and her sister’s friend who traveled down to visit. 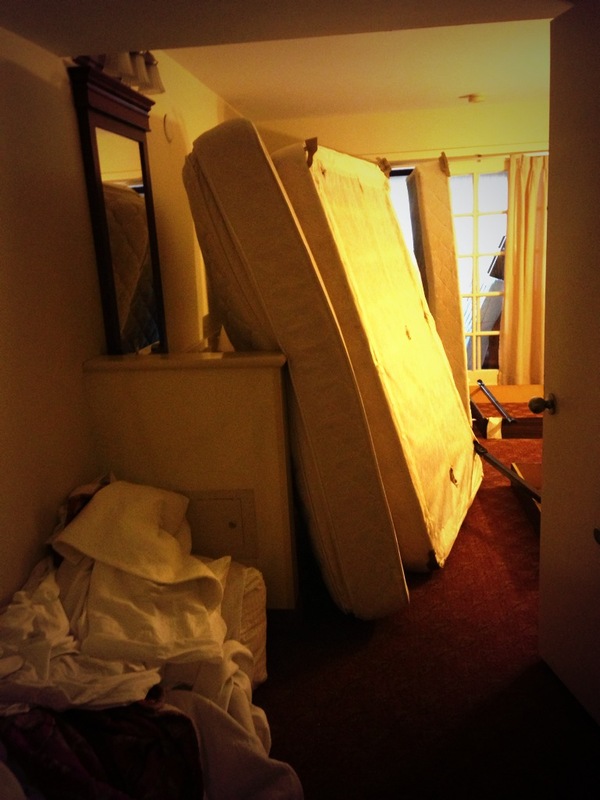 Before that, we were able to check into our sketchy Los Angeles motel and soak in two hours of sleep. Then we headed back to the airport to pick up her sister and then head to Disneyland. For two days. With a full day of Disneyland on just two hours sleep—you could imagine—my wife and I wanted nothing more than a little sleep. The four of us stood there, weathered and jet lagged. We looked at each other and erupted into laughter. Thanks, La Quinta. I’m thankful, but this test in patience wasn’t necessary. I’ve had my fill this week. Also, the coffee just cooled and it tastes like the devil. Do you have any travel horror stories? Any good layover tips? What do you think? I read this post specifically for an explanation of that bedroom. what happened there/? The lady at the front desk was as surprised as we were! She said that it was “under maintenance” and they must’ve forgot to let her know. I have lingering suspicions of a rock star hotel room tantrum. Haha. Oh god, I hope so. hahaha. awesome. My wife and I had a similar layover at LAX to Disneyworld in Orlando, FL. We were taking a red-eye flight anyhow, but we spent three extra hours, in the wee hours of the night/morning, waiting for our plane to be fixed. We too, enjoyed our first day on only two or three hours sleep. I had worked the entire day prior to the flight, she had worked too – taking care of our kids, making sure all the last minute details were accounted for. We didn’t find a crazy messed up room when we got to our room, thank God. Hopefully you are getting rest now! Or soon! Sounds like a very similar situation. I’m glad we don’t have kids yet (for many reasons); it seems like a long layover with children would definitely test patience. Thanks, Tom. When I was a teenager we went on a trip and the rollaway cot (for my brother) was wheeled in to our room. When we opened it, there were bloody sheets. Um. yeah. That was awesome. No way! That’s insane. Good story. One night my family was traveling back to New York late and booked a cheap motel sight-unseen because it was cheap. It was around 2 a.m.. When we pulled in, we discovered, it served as accommodations (if you know what I mean – wink, wink, nudge, nudge) for an Elephant-themed bar. We checked out a room and found the carpet stained with unknown substances and cockroaches in the bathtub. We had to fight for almost an hour with the clerk to get a refund, so it was nearly 3:30 a.m. before we pulled into a rest stop where we decided to sleep for a few hours before travelling home. But you know, such suffering is good for the soul. Or at least it makes for a good story. It was probably about 33 years ago, way before my husband and I discovered “you get what you pay for”, we stayed in a motel in Daytona. Nice enough (not really) but fit our budget (which was low). We woke up after our first night and the entire bedroom, walls, bed, floor was covered in roaches! It was like waking up in the worst nightmare you can imagine. We got our kids, dressed and headed to the check-in desk. There we were, along with another couple, complaining of the same thing. The desk attendant called the police on the other couple (we were just as mad, but were not as verbal as they were). The manager gave us another room (we had paid cash in advance and he would not return our money…another lesson learned) and we went out and bought a couple of cans of roach spray and sprayed the entire room. We never saw anymore roaches, but we did call the Health Department and left a message (it was a weekend) and we had planned on staying 3 nights, but left after 2, we just couldn’t stand it. A few weeks later we got a letter from the Daytona Health Department saying they visited the motel and found roaches and enclosed was a refund check for our one night stay that we forfeited. We were much more selective of motels/hotels in the years to come (I’ll either pay for a great place or stay home) and we’ve never had anymore trouble. But just the thought of waking up with all those roaches!!!! It still makes me shiver!!!! Debbie, that is absolutely frightening! I read this comment out-loud to my wife and her sister; it drew plenty of good-quality sequels. A layover is never good. Being forced into buying airport merchandise would be even worse! Thanks for the story. Well thank you for the compliment! We switched rooms (that room was under “maintenance”). The room we switched to also had issues but at least the bed was on the floor!